Can Dogs Drink Beer or Any Other Alcoholic Beverages? Today’s question: can dogs drink beer? Is beer bad for dogs? Scroll down for detailed answers. After a hard day at work, there is nothing more pleasant than to grab a bottle of beer and enjoy it with your friends. However, what if this time, the friend you are sharing your beer with is your dog? Is it okay to share your drink with your canine friend? While dogs tend to eat most any food given to them, or any food lying about, dogs also tend to drink many offerings as well! Dogs usually drink water, but have been known to drink lemonade, tea, coffee, and even beer. Many athletes may find joy and humor in offering their dog beer during a softball game or at a tailgate party. 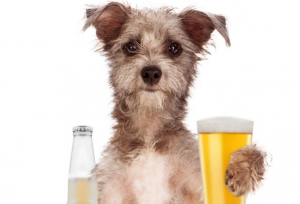 Beer has health benefits for humans when drank in moderate amounts, but what about animals? Do animals drink beer? We are so concerned with what our dogs eat, that we almost forget to focus on what they can or cannot drink. Foods are well researched before giving to dogs, and food is offered usually on behalf of the health benefits. Food offers extra vitamins and minerals to keep your dog healthy, but about drinks? Should alternatives to water be offered to your pup? Everyone knows that water is the universal drink for a dog. But if you are watching a football game with some friends and you are drinking beer while your dog is right beside you, can you give him a bit of that beer? Can dogs drink beer? This is the question we are about to focus our attention on for the rest of this article. No matter how long your dog will insist on you giving him a beer to drink, and regardless of how much he is going to beg for it, you should not, under any circumstance, give him/her this beverage. Beer is an alcoholic beverage and should not be consumed by dogs, or any animal for that matter. Yes, dogs need to hydrate, and yes, dogs may enjoy the taste, but the alcohol content of beer is too high for dogs and not recommended for their consumption. Here is one thing you should know about dogs: they should never consume alcohol. If they accidentally do so, they will get to experience a wide variety of symptoms from vomiting to brain damage and sometimes even death. Just as humans should not consume alcohol in excess, neither should dogs. Dogs digest food and drinks differently than humans and dogs do not have the ability to process alcohol, or to process without damage. No matter how much they are asking for it, beer should be kept off limits for your pet! Just like in the case of humans, consuming beer will bring on a great amount of damage to your dog’s body. Alcohol causes harming effects on your dog’s organs such as the liver, kidneys, and even brain. Beer also dehydrates those who drink it, making your dog that much more vulnerable to dehydration on a hot day. Putting your dog in harm’s way simply because you do not want to offer traditional water is irresponsible. Some people give their dogs beer to drink just to have little fun. If you see that your dog is acting drunk, you should stop giving him/her beer immediately. Dogs should not be intoxicated. The purpose of a dog is to remain healthy and alert at all times-better to hunt, gather, and protect his/her master. Dogs do not have the ability to function when intoxicated and their mental health may be at risk as well, when this new feeling takes over and cannot be processed. When at a party or an athletic event you and your friends may find it to be funny to watch your dog wobble around, but it is extremely dangerous for the pet. When it comes to dogs and beer, there is no such thing as a safe amount. Any amount could harm him, so to avoid any unpleasant events; you had better keep that beer to yourself! In the event your dog has opened a beer and poured him/herself a glass, or your dog has somehow consumed beer without your help, please keep an eye on your dog to ensure his/her safety. Have your dog drink a lot of water and rest to try and pass the beer naturally and returned to their normal state. Calling your vet may be a good idea as well, simply to ensure your dog is safe given their size and breed. As long as you are honest with your vet, your vet will not judge you or report you for your dog having drank beer. Vets have seen these cases before and have the best interest of your dog in mind and will help you to help your dog recover. As we have previously mentioned, there are several health risks that come along with the consumption of beer for dogs. We thought that it would be a great idea to talk a bit more about the hazards of alcohol, so that you will be completely aware of the danger your dog could face. Liver damage – The dog’s liver and alcohol do not go hand in hand. The liver of a dog is tiny and because of its small dimensions it is difficult for it to process the alcohol in beer. This type of damage cannot be repaired, and can be fatal. The livre is even smaller on a dog than on a human, so caring for this small organ is very important. Dehydration – If you give beer to your pet instead of water, you will not provide him/her with the necessary amount of hydration s/he needs. Moreover, that beer will take out the water from his/her system and all the essential electrolytes as well. As a result, s/he will start losing minerals such as sodium, chloride and potassium. Your dog needs water to stay healthy, not beer. Physical depression – You can see that when the dog drinks alcohol, s/he will start to lose coordination. His/her heart rate and breathing will slow down and from that stage, s/he can easily go into a coma. Beer attacks nervous system which can become depressed. Your dog should also feel confused when an intoxication feeling comes over him/her. Dogs are not aware of alcohol ad how the chemical alters ones brain. The dog beginning to feel drunk will be confused and worried and without the ability to understand the feeling will pass. Dogs may become increasingly agitated and worried as the alcohol takes hold. Low blood sugar – Any amount of alcohol your dog will take in will cause a major drop in the blood sugar. Moreover, your dog is going to be more exposed to seizures and brain damage. Dogs need to have a balanced blood sugar level and consideration should be made to ensure the blood sugar levels stay normal. Kidney damage – It is already known that kidneys are crucial for the body as they filter blood, water and the electrolytes in the bloodstream. Alcohol will damage them and disrupt their normal activity, increasing the risk of your dog getting sick or even die. Alcohol damages the livers of humans quite easily over time. The liver of a dog is also susceptible to damage. Many adults do not consider the liver functioning of their pets when considering their pet’s health. The body system of the dog should be thought of and cared for just as that of a human’s. Just as symptoms of intoxication appear in a human, the symptoms of intoxication can show in a dog. When humans are hungry, have not eaten, or have an empty stomach, drinking alcohol can cause quick intoxication. The same occurs within a dog, but on a grander scale. On an empty stomach, regardless of the amount of alcohol taken in, the symptoms will be shown in about 30 minutes. If your dog’s stomach is full, it might take 2 hours for the symptoms to occur. Keeping an eye on your dog regardless of how much time has passed is important. Your dog may look normal after a half an hour, or even two hours, but your dog may exhibit symptoms three hours later or longer. Depending upon how his/her body processes the alcohol, you will need to be sure your dog does not fall into danger. The toxicity of alcohol is heavily dependent on body weight. Remember, dogs weigh a lot less than people do, which means that it takes a lot less alcohol to make them dangerously sick. If you believe your dog has consumed a lot of alcohol, take your dog to the doctor as soon as possible so the treatment can be administrated right away. You do not need to wait for symptoms to present themselves. Your vet will have the ability to diagnosis and trat nay potential side effects as well as guide how to proceed in flushing out the toxins. In the event you cannot get to a vet right away, give your dog water to hydrate and attempt to flush out the toxins. Feeding your dog may also be a good idea because food aids in processing the alcohol and could release the toxins from his/her system faster.